2015 November 14: Holiday Giveaway!! Cozy Up to “Peppa Pig: Cold Winter Day” This Winter Season! Holiday Giveaway!! viewers join Peppa and her family and friends as they build a snowman, throw snowballs, race their sleds and much more! I received a copy of this delightful DVD that is just perfect for the upcoming Winter season! 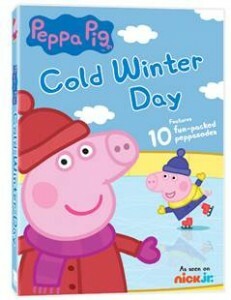 Young children will laugh out loud and really enjoy Peppa and watching her Winter time fun. I highly recommend for ages 2-5. The new release features 10 “peppasodes” that are filled with all the kindness, laughter, and gentle life lessons that make Peppa Pig one of the world’s most beloved preschool properties. This would also make the perfect stocking stuffer! We have teamed up for a Giveaway! One winner will win the DVD! To enter, leave a comment below telling us your favorite (or your child’s favorite) Winter time activity. Deadline to enter is November 20th, 2015 at noon PST. One winner will randomly be selected via Random.org. Self Disclosure: I received a free copy of the DVD to facilitate this post. Credit: Peppa Pig.